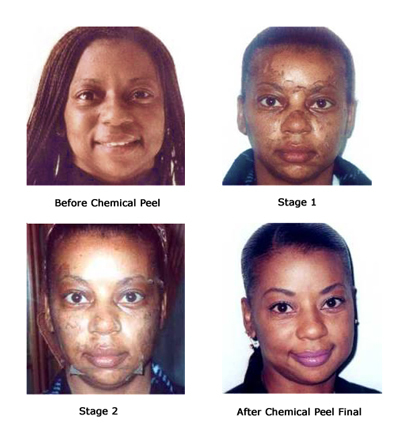 Chemical peeling is basically an accelerated form of exfoliation induced by use of a chemical caulerant agent. The depth of the peel is determined by the clients’ condition. The most common complaints that bring clients into The Skin Studio for chemical peel consultations are, wrinkles and dyschromias (alterations in pigmentation). Both of these conditions are commonly associated with excessive sun exposure and photodamage (sun damage). During the consultation, the client’s skin is closely examined and a classification system is used to determine the level of photodamage based on histological (tissue) depth of visible clinical changes. Chemical Peels are also performed at the Skin Studio to accelerate the treatments for our acne clients. These treatments on our acne clients have produced amazing results. (See Sebaceous disorder - Acne) At The Skin Studio, we have been successful in performing Chemical Peels on people of all colors. Skin treatments prior to the peel is the secret. What is the major difference between peels and laser resurfacing ? Peels and laser resurfacing are used to treat different depths of facial wrinkles. Some peels such as light glycolic peels provide light exfoliation, which can treat fine lines, smooth out skin tone and make skin feel softer. Deeper peels simply treat deeper wrinkles and are good for people who do not yet need laser resurfacing. However, the deepest wrinkles generally require skin resurfacing with a CO2 laser. You should be aware that the recovery time increases with the depth of the treatment. I'm planning on spending the holidays in Hawaii and I was wondering how soon can you go out in the sun after having a chemical peel or laser surgery. After a peel or laser resurfacing, the skin is vulnerable to pigment damage from sun exposure. The amount of time you would have to avoid sun exposure depends on the depth of peel or resurfacing. With a deeper peel or the deeper laser resurfacing, you should remain out of the sun for several months or more. Because it is very important to avoid sun exposure for some period after skin peel or resurfacing, fall is a very popular time of the year to have peels or laser resurfacing. I turned 43 last week and at my birthday party, my girlfriends and I were talking about the different ways we're starting to look older. Not old, mind you, just older. Most of us have fine lines around our eyes and mouth and one friend complained about the permanent bags under her eyes. Personally, I would like to have my lips done- They've been getting thinner. None of us feel we need major surgery, but all of us would like a little something. where do we start ? Your concerns are typical of young women considering plastic surgery for the first time. These "entry-level" procedures usually top the list of most popular procedures every year. To treat fine lines and wrinkles our office recommends peels or LED Treatments. We also recommend special skin products that have anti-aging properties.